Sue Hattersley, head of the department at the Food Standards Agency responsible for imposing the “bureaucratic nightmare” of new regulations complained of by 100 leading chefs and restauranteurs last week claimed, by way of justification, there is evidence that those with food allergies “are reluctant to go out to eat spontaneously for fear of any allergic reaction that might result”. As it is a simple enough matter for anyone visiting a restaurant to inquire about the ingredients on a menu, I suspect that this “evidence” is likely to be less than compelling. Indeed, over-zealous concerns about the hazards of food allergy are almost certainly a major contributing factor to its increasing prevalence in recent years. This paradoxical insight was prompted initially by the observation that peanut allergy is 10 times less common in Israeli compared to British children. Professor Gideon Lack of London’s King’s College Hospital speculated this might be due to the popularity in Israel of Bamba infant food, which contains peanuts, and sure enough his subsquent study, as recently reported in this paper, in which children were randomly selected to consume peanuts when young markedly reduced (by 80%) their subsequent risk of becoming peanut allergic. Further, those who are peanut allergic, researchers at Cambridge University have shown, can be “desensitized” by gradually increasing the amount of the nuts consumed. Taken together, that would seem a lot more persuasive than the sort of evidence justifying the Food Standards Agency’s bureaucratic nightmare. 1. Sue Hattersley, the much respected head of the Foods Standards Agency Allergy division, retired over six months ago so I very much doubt that she has said anything about the matter at all, and she has certainly not said anything in an official capacity. 2. The Food Standards Agency are not responsible for the new allergen regulations; they have been imposed on all EU countries by the EU Commission/European Food Safety Authority in Brussels. 3. It may be ‘simple enough for anyone visiting a restaurant to inquire about the ingredients on a menu’. The point is not whether it is simple to enquire, but whether you are likely to be given accurate information. The answer to which, up till now, has been more than likely, no. Hence the need for the regulations requiring outlets to actually know whether any of the major allergens are in their foods and if so, which ones in which dishes! 4. Would that one could deduce that ‘over-zealous concerns about food allergy are almost certainly a major contributing factor to its increasing prevalence’ from recent LEAP peanut studies; how simple would that make things. Meanwhile, just ask any allergist…. 5. No – researchers at Addenbrookes Hospital near Cambridge (not Cambridge University) have shown than it may be possible to desensitise allergic people by giving them gradually increasing doses of their allergen. But this work is at a very early stage and is certainly not yet being used in general clinical practice. 6. The final reference to the FSA’s bureaucratic nightmare refers to food fraud, not to food allergy. Yes, the cumin and paprika in question did include almond and peanut shells, which obviously poses an allergy threat for those allergic to almonds or peanuts, but the issue was food fraud and transparency – not allergy. ‘The French word for a person who owns or runs a restaurant is restaurateur, with no n, and this is the spelling used most often in English, especially in edited writing.’ from The Grammarist – while ‘restauranteur’ does not even appear in the OED! No – I have not had a Damascene conversion and I do NOT think that the new allergen regulations are wonderful – but I do think that the Food Standards Agency is trying hard, in an extremely difficult area, to do the best they can for allergic consumers – even though that best may not always match up to our wishes or expectations. This is not really a change of heart as I have always been aware that they, and in particular their allergy department (decimated by the cuts a few years ago), were doing a worthy job in providing good and reliable information via their allergy site. But, as I think we probably all do, I had tended to ignore the fact that what they do is largely prescribed by their European colleagues. What I had also forgotten was that the FSA also fund/are involved in some really useful research – I will give a few details of some of this in the next post. Meanwhile, Sue Hattersely, head of allergy at the FSA, has responded to both my blog on the new allergen labelling regulations and the article on the FM site and you can read her response in full here. Here goes on a quick response to her response…. Sue poins out that the allergen boxes were only ever voluntary and therefore were not ‘policed’ and were sometimes wrong. Moreover, they were effectively repeating the information already given in the ingredients’ list and the EU regulators were very keen only to provide information once, and in one place so as not to cause confusion. I am afraid that this does not really wash with me as I still think that obligatory, accurate ‘contains’ boxes, situated next to the ingredients (all in favour of all information being in the same place) would be very helpful for the allergic consumer and would not only make their shopping a lot easier and faster but also safer. However….. The UK was the only country within the EU that actually used these boxes – no one else seemed to see the point of them. So the chances of getting them universally adopted were, realistically, non existent. Moreover, derogation (doing what we want, whatever about anyone else) is not a option as the new ingredients listing requirements are a law and derogations from laws are not allowed. So, since we obviously ain’t gonna win this one, I shall (sadly) cease banging on about it and keep my powder dry for a different fight! I still think that it would have been much better to settle on one way to highlight major allergens rather than allowing choice between bold, underline, italic etc. However, in practice it appears that most manufacturers are settling on ‘bold’ so let us hope that does in practice become the norm. The new rules do also require minimum font sizes and legibility for all major allergen declarations which should help them to stand out. Anything would be better than what is currently all too often on offer: 12 languages, on shiny paper and so small that, even with a strong magnifying glass, it is all but impossible to read! When you do and do not need to add ‘milk’ or ‘gluten’ after listing the ingredient still seems to me to be dreadfully confusing. The ‘milk’ declaration is based on the the existing rule that ‘milk’ refers only to cow’s milk – so it is not necessary to make it clear that ‘cream’ or ‘butter’ is from cow’s milk, although you may, as a manufacturer, chose to do so. However, ‘getting’ this requires you to be familiar with food labelling law – and how many of the allergic population are?…. To most people ‘milk’ is ‘milk’, no matter what animal, or bean, or nut it came from. Similar confusion applies to ‘gluten’ – Alex Gazzola has blogged in some detail on this here. I can only hope that the commission will come back to this one fairly speedily as I feel the current rules may lead to total confusion and therefore major risk to seriously allergic consumers. Once again, I do not really buy this. The point of ‘warning phrases’ such as ‘this product has been made in a factory which also uses nuts’ etc is not to quantify the risk but to alert the consumer to the existence of a specific risk. It is impossible to quantify the risk as it will be different in every circumstance but giving the consumer some idea of the circumstances in which the product was made allows them to make their own risk evaluation. Nor do I feel that thresholds are really relevant here, quite apart from the fact that there are unlikely to be any usable ones for another 4 to 5 years. Once again, one is not trying to quantify a risk but alert the consumer to its existence. Even were thresholds to be useful in the rules that the commission finally comes up with, I believe that an interim arrangement giving some very basic guidelines as to the circumstances in which the product had been manufactured would have been hugely helpful to the allergic consumer. Sue was, I feel, really quite upset that in all the huff and puff about the labelling of retail products, no one had really focused on the new requirements for the provision of allergen information in ‘food sold loose’ and in food service – a major step forward from no information at all, which is the current state of affairs. 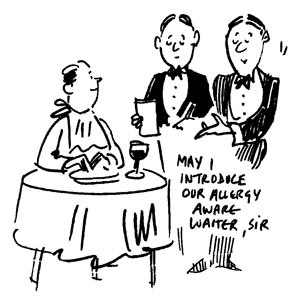 Many of us had complained that although a requirement that information should be provided was a major step forward, we were very concerned that it could be provided verbally rather than in written format – because we had very little faith in the allergy awareness of the average waiter/waitress/chef/member of the kitchen staff and were concerned that they would get it wrong. And this does remain a very real concern. Would anyone remember to change the written information about the products and the allergens or would the old information be handed out? At least if a staff member had to ask in the kitchen about the relevant allergens, the chef might remember that he/she had changed the recipe, or that a different apple crumble had been delivered. Frankly, neither scenario is particularly confidence building for an allergic diner – which makes me think yet again that the way forward for the majority of food service may be to source individually wrapped and sealed ‘freefrom’ dishes which come with their ingredients listed and which can be heated and served in their wrapper thereby side stepping the whole issue.